Home / Applications / Laboratory Ovens"
Laboratory ovens use thermal convection to deliver heat to the chamber, which allows them to maintain uniform temperatures. It is used in various applications in industries such as life sciences, pharmaceuticals, engineering, institutions, environmental and more. Generally, most laboratory ovens are used for heating, drying or sterilization purposes. It can also be used to perform material testing for instance, to determine tensile strength, deformation, and resiliency of a product. The most economical option are Natural convection ovens. Fan assisted convection ovens, also known as Forced Convection Ovens, are able to achieve greater temperature uniformity and offer faster recovery rates. A Furnace would the best for extremely high temperature applications. Environmental Laboratories need to determine the moisture content of a sample. 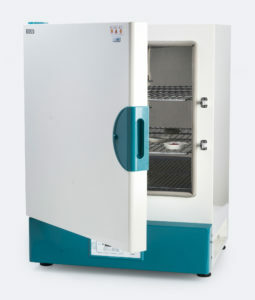 In order to obtain this, users will dry their specimens in laboratory ovens and calculate the difference of the sample’s weight before and after the drying process. Gravity convection and forced-air ovens are used for such application.